As one of the leading moving and storage companies in Columbus, Angie’s List thought we would be a good fit for their #ProConvo series on Twitter. In a question and answer style, moving companies were invited to share their knowledge. From estimates to preparing for a move to saving money on your move, learn everything you need to know about moving and moving and storage companies. Q. What does a moving estimate entail? What doesn’t it cover? A. At Leaders Moving we give our customers a guaranteed, flat rate price based on what we are moving regardless of the time or weight. Some companies charge extra for stairs, long walks, or fuel. Our estimates include all items and services. Therefore, there are no hidden fees. Q. What is the biggest mistake you see homeowners make when moving? A. One of the biggest mistakes is for a homeowner to close on the home and move on the same day. It can often result in rushing, which can lead to mistakes. Another big mistake is not being prepared for the move. This includes packing, scheduling cable or utilities, and unhooking appliances. Finally, don’t have unrealistic expectations for the move. Moving can be stressful and having unrealistic expectations can add to the frustrations, so plan for last minute changes or unexpected delays. Q. How far in advance should movers be hired? A. Scheduling your move depends on the time of year. In the slower months, October thru April, we recommend 2 weeks notice to schedule. However, in the summer peak season (May thru October), we recommend 3-4 weeks notice. Leaders does not require a deposit to schedule and there are no fees to reschedule. Q. How should someone approach a cross-country move vs a cross-town move? A. Packing is the biggest difference between the moves. For a local move, you might be able to have family or friends hold items for you, but in cross-country moves you can’t. Make sure for any move that if the item will fit in a box then make sure it is in a box. Also, loading time is more intensive for a cross country move compared to a local move because extra precautions need to be taken for the long trip. So, be prepared for a longer day. Q. What happens if a prized possession is damaged/lost? A. To prevent hassles from damaged items, make sure you always know the valuation coverage you have selected. All moving companies are required to carry a minimum of $.60 per lb., with expensive up-charges for Replacement coverage. At Leaders, our basic coverage is a Depreciated coverage with Replacement coverage as an option. One way to guard against possible damage to an irreplaceable item is to take the item with you personally when you travel to your new home. Q. How can we make moving as green as possible? A. One of the ways Leaders Moving helps contribute to being green is through our box recycle program. We will actually buy the boxes from our customers at 80% of the cost. We reuse or recycle these boxes. In addition, as a homeowner, you can always donate food, clothing, or other items to local charities. Leaders Moving works with many local charities, including The Family Mentor Foundation, which helps give lunches to children in need. Ask your mover, if they can help your donate items. Q. How can homeowners save money on a move? Where SHOULDN’T a homeowner cut costs? A. You can save money on your move by packing items yourself and moving some of the smaller items yourself. Also, get rid of items you don’t need will save on the cost to move them. However, sometimes it is more economical to have the movers move the items than get rid of it and buy new items later. You can save and even make money by selling some of your items in online auctions or yard sales. Q. If homeowner plans to move all on their own, what’s the best method to pack a truck? Furniture or boxes first? A. The best method to pack if you are moving yourself is to start with bedroom furniture and fill in the open spaces with boxes. Loading a truck is very much like Tetris, it can be addicting. Every job is different just like the game…it is definitely an art. Q. What should homeowners know about pickup and delivery dates? A. Most movers give a delivery window of multiple days, but it could be up to a 2 week window for delivery. Here at Leaders, we can give an exact pickup date and delivery date for no additional fees. Make sure you completely understand what dates the moving and storage companies are giving you. A. At Leaders Moving, we have moved a cat for one customer and kept a dog for one week for another customer. You would be amazed at what you find under some furniture pieces, please look before moving day. Also we had the honor of moving the Heisman Trophy for Ohio State Buckeye football player Troy Smith. 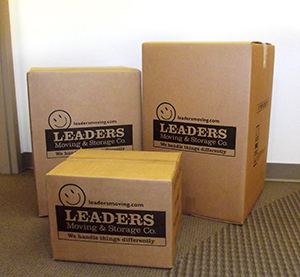 Leaders Moving & Storage Co. has been in business for over 21 years. We’ve gained a lot of experience in local moving and we are experts on the topic. Check out our reputation with Angie’s List. Give us a call at 1-800-481-6843 and we will answer any questions you have. If you’re moving soon, get a Quote Now to get the process started. Want to see more of the #ProConvo on Moving? Check out this summary from Angie’s List.